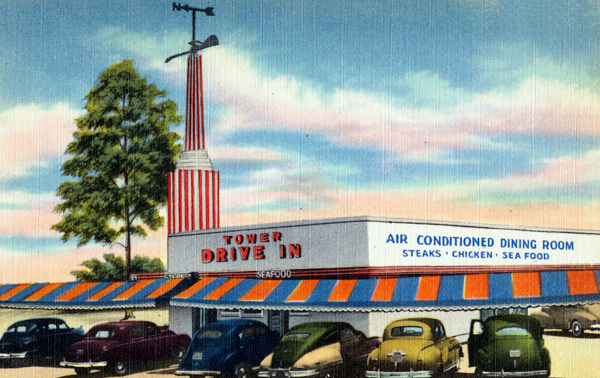 You are viewing the archive for the ‘Drive-in ice cream parlor’ tag. More than a hundred-year-old ice cream parlor, Doumar’s, is just a mile away from the downtown Norfolk Virginia. 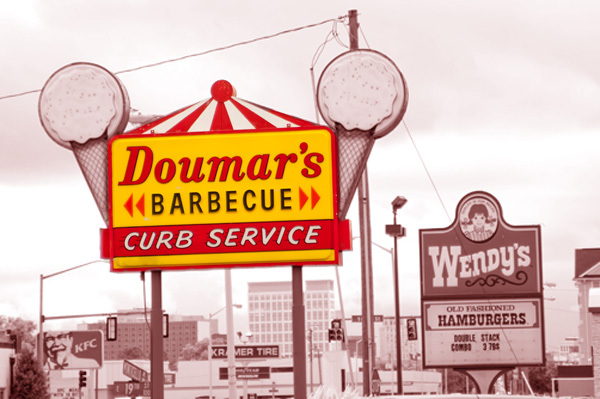 Doumar’s takes you back to the 50s America, where cars and fast food drive-in like this dominated the American landscape. Waitresses no longer wear roller skates to deliver your meal, but still don iconic 50s style uniform (hat) while serving your food. 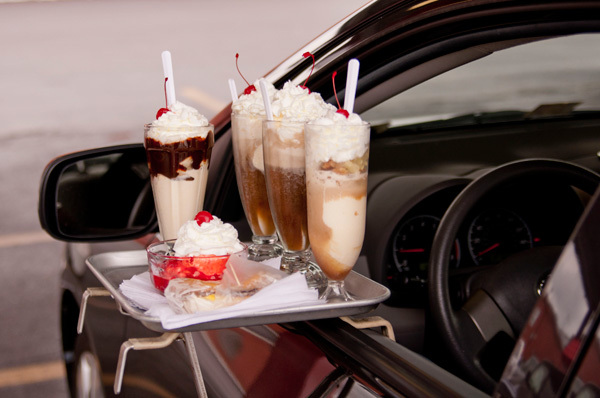 This drive-in restaurant serves classic sandwiches such as burgers, pork barbecue along with shakes, floats, and other traditional ice-cream desserts. Most items are classic and made in traditional way.One of the main attractions is its homemade ice cream cones. 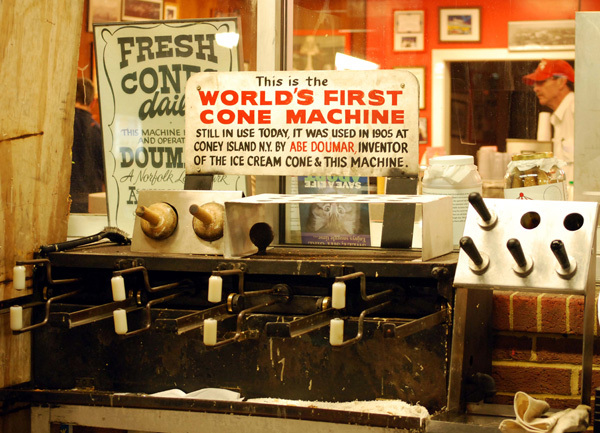 Established in 1907, Doumar has the oldest operating ice cream cone maker in the world. It’s original owner, Abe Doumar’s is said to have invented a hand-rolled cones for ice cream in 1904, at the St. Louis Exposition. The cones are still made today by hand in the machinery of that era. Dumars is a drive-in restaurant, not a modern drive-through, ones found in place such as McDonald’s. 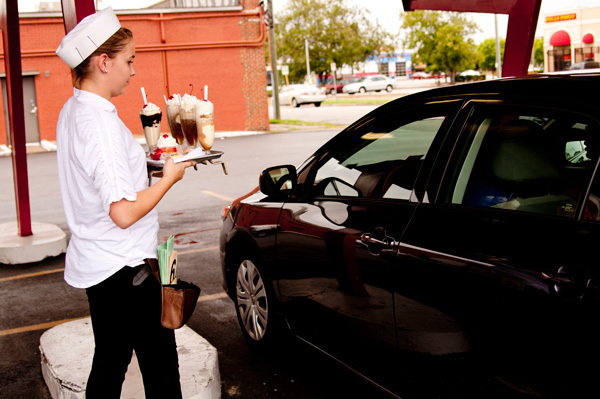 Contrary to drive-through restaurants, where you buy a meal and eat somewhere else, at a drive-in restaurant, you are served by a waiter in your parking space and encouraged to dine in there. Nowadays, you can barely see drive-ins except in the movies set in 1950s, where they symbolize the entire era of post-war America.Even the neighborhood of Doumar’s is dominated by drive-through chains. So how can I avoid not savoring this piece of American culinary history during my every visit near it?